Super Savings Item! 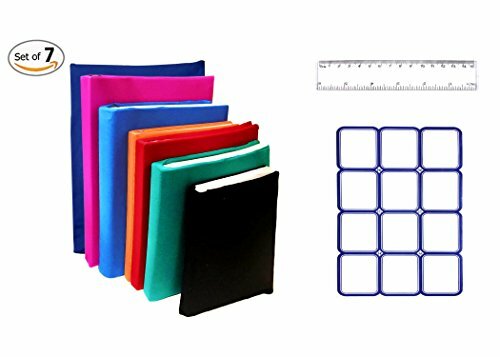 Save 39% on the Stretchable Jumbo Book Covers Set of 7 Individual Colors Book Suits fits Hardcover Textbooks up To 9.5'' X 14'' Durable Washable Reusable Extras Labels and Ruler by Book Suits at Transparent University. MPN: BOOK6JUMBO. Hurry! Limited time offer. Offer valid only while supplies last. NEW & IMPROVED!!! The Most Durable And Striking Book Covers Are Now Available On Amazon! Do you like to keep your books clean and protected? The Most Durable And Striking Book Covers Are Now Available On Amazon! Do you like to keep your books clean and protected? Have you been looking for a smart, effective way to keep your children's school books safe from scratches and damage? The Book Suits® textbook and book covers are exactly what you need! These top notch book protective covers are made of premium quality, sturdy material. You can effortlessly put them on and off as they are reusable! Washable too, if you wish to clean them. Each Bookcover also has a ribbon bookmark to easily locate a particular page. What is more, you receive a set of 12 stick on labels to identify your books along with a clear 1 foot ruler! The Book Suits covers are 14.5" x 9" or 37cm x 23cm in size. Moreover, they are stretchable which makes them ideal for both medium size and large size hardcover books. Keeping your books perfectly protected has never been easier before! This amazing stretchable book cover pack includes 7 differently colored protective covers. The striking teal green, orange, magenta pink, light blue, navy blue, black and red colors will help you keep your books in order. Forget about wasting your money on buying low quality, cheaply made covers that are costly and which do not last for long. The Book Suits protective, reusable cover pack is the smartest, most cost effective way to keep your books in excellent condition! Keeping you satisfied is our priority so we offer you a 100% money back guarantee if you are not totally happy with your purchase! And now, Book Suits is a registered trademark, to ensure the quality you deserve!  PREMIUM QUALITY COVERS: These durable covers can preserve your books in excellent condition.  IDEAL FOR ALL BOOKS: The Book Suits stretchable covers are ideal for medium or large size books!  100% RISK FREE PURCHASE: Get a full refund or a product replacement if you are not 100% happy. If you have any questions about this product by Book Suits, contact us by completing and submitting the form below. If you are looking for a specif part number, please include it with your message.